12 June/July 2018 unmanned systems inside MY SECOND PIECE OF ADVICE: Drone regulation is expensive. Act a ccordingly. Your predecessors faced the same problem when the railroads came, when electricity was invented, when automobiles became popular and when they made pocket-sized phones. Each of these major technological advances involved mixed federal/local regu- lation schemes that largely paid for themselves. Automobile owners pay a state registration fee, purchase a drivers license and pay for local roads with taxes on gas. Railroads and power companies paid local government for their easements decades ago but continue to pay local government for maintenance on areas where easements interact with the public (railroad crossings, removing vegetation from power lines, etc.). Should you create high speed, low risk drone transit routes and charge a minimal fee? 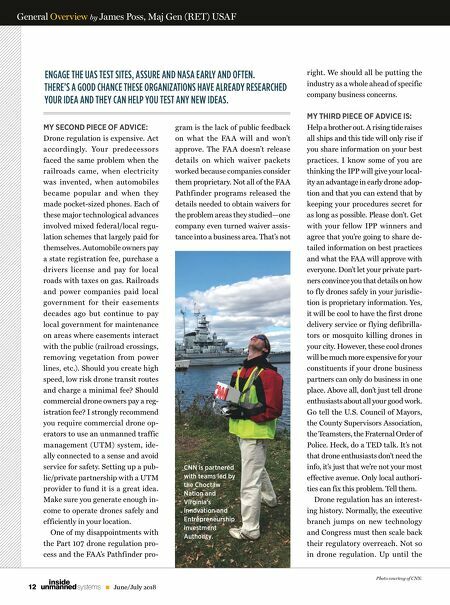 Should commercial drone owners pay a reg- istration fee? I strongly recommend you require commercial drone op- erators to use an unmanned traffic management (UTM) system, ide- ally connected to a sense and avoid service for safety. Setting up a pub- lic/private partnership with a UTM provider to fund it is a great idea. Make sure you generate enough in- come to operate drones safely and efficiently in your location. One of my disappointments with the Part 107 drone regulation pro- cess and the FAA's Pathfinder pro- right. We should all be putting the industry as a whole ahead of specific company business concerns. MY THIRD PIECE OF ADVICE IS: Help a brother out. A rising tide raises all ships and this tide will only rise if you share information on your best practices. I know some of you are thinking the IPP will give your local- ity an advantage in early drone adop- tion and that you can extend that by keeping your procedures secret for as long as possible. Please don't. Get with your fellow IPP winners and agree that you're going to share de- tailed information on best practices and what the FAA will approve with everyone. Don't let your private part- ners convince you that details on how to f ly drones safely in your jurisdic- tion is proprietary information. Yes, it will be cool to have the first drone delivery service or f lying defibrilla- tors or mosquito killing drones in your city. However, these cool drones will be much more expensive for your constituents if your drone business partners can only do business in one place. Above all, don't just tell drone enthusiasts about all your good work. Go tell the U.S. Council of Mayors, the County Supervisors Association, the Teamsters, the Fraternal Order of Police. Heck, do a TED talk. It's not that drone enthusiasts don't need the info, it's just that we're not your most effective avenue. Only local authori- ties can fix this problem. Tell them. Drone regulation has an interest- ing history. Normally, the executive branch jumps on new technology and Congress must then scale back their regulatory overreach. Not so in drone regulation. Up until the General Overview by James Poss, Maj Gen (RET) USAF ENGAGE THE UAS TEST SITES, ASSURE AND NASA EARLY AND OFTEN. THERE'S A GOOD CHANCE THESE ORGANIZATIONS HAVE ALREADY RESEARCHED YOUR IDEA AND THEY CAN HELP YOU TEST ANY NEW IDEAS. gram is the lack of public feedback on what the FA A will and won't approve. The FA A doesn't release details on which waiver packets worked because companies consider them proprietary. 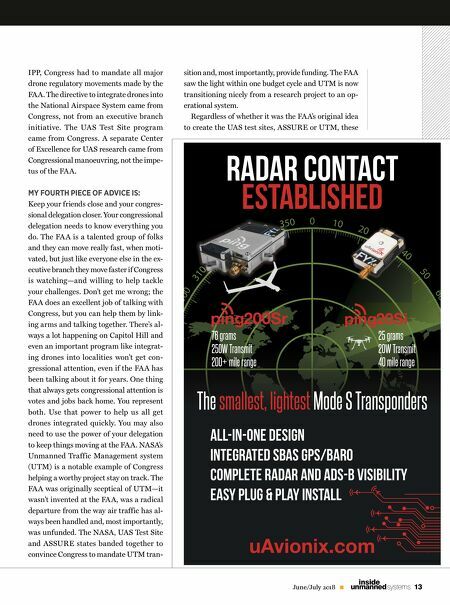 Not all of the FAA Pathfinder programs released the details needed to obtain waivers for the problem areas they studied—one company even turned waiver assis- tance into a business area. That's not Photo courtesy of CNN. CNN is partnered with teams led by the Choctaw Nation and Virginia's Innovation and Entrepreneurship Investment Authority.